For full marks, memorize and follow these instructions carefully. Test dates are posted on the Course Home Page. Put them in your agenda. 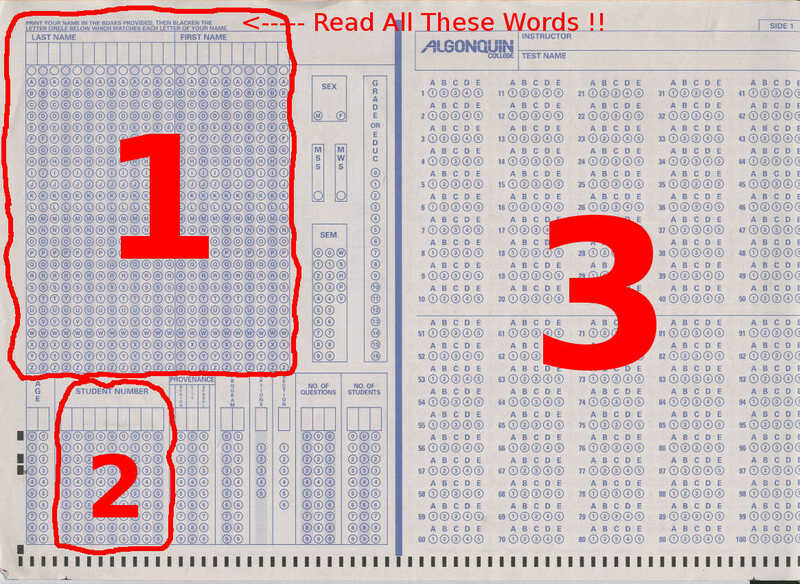 Tests and exams include multiple-choice questions on large blue Scantron mark-sense “bubble” sheets. If you have never filled out one of these sheets before, ask your instructor to show you how to do it before the test. Bring at least two dark, soft pencils to fill out the sheet. The blue “bubble sheet” mark-sense forms must be filled out in soft pencil only, e.g. pencil type HB. Only dark, soft pencil works on the mark-sense forms. Do not use pens or hard (light) pencils. Bring a good eraser to all your tests. Poor erasing will result in a wrong answer. Use a good eraser and erase fully. You may use a simple calculator on any test, if you need it. No phones; no digital assistants; just a simple calculator. You will never need a calculator; the math will be simple enough to do without one. A field on a mark-sense (bubble) sheet means both the round bubbles and the hand-written text above the bubbles (if provided). When you are asked to fill in a field, you must use a pencil to fill in both the round bubbles for the field and also the text across the top of the field. Do both. Enter your personal three-digit Test Version number into the round bubbles of both the NO. OF QUESTIONS and NO. OF STUDENTS fields on the form. Fill it in twice; six bubbles total. Write the version numbers in digits above all the filled-in bubbles in the spaces provided so that your instructor can read them. Enter your unabbreviated College Full Name with last name first into the round bubbles of the LAST NAME and FIRST NAME fields. Write your name in letters above the filled-in bubbles in the spaces provided so that your instructor can read it. Fill in only one answer bubble for each question. Do not fill in any other fields on the bubble sheet. The scanner cannot read your handwriting; you must fill in the round bubbles for all three things, above, so that the scanner reads each. The scanner must be able to read the filled-in round bubbles of all three items above. Fill in the round bubbles for all three things and also write your name and test version number above the bubbles in the square spaces provided so that a human (your instructor) can read it. The above three items are all you need to enter on the mark-sense form. Nothing more. You do not need your student number or your gender. Everyone in the room gets a different version of the test. The Test Version number is a three-digit number clearly labelled as Test Version near the top left of the front page of your own personal question sheet. You must copy correctly this three-digit number from your personal question sheet into two fields on the mark-sense form. Copy the three digits into the NO. OF QUESTIONS field and also into the NO. OF STUDENTS field on the bubble sheet. Make two copies of this Test Version number. In addition to filling in the bubbles, also write the test version number in the spaces provided above the bubbles so that a human (your instructor) can read the number. For full marks, the spelling of your name on the bubble sheet must match the spelling used by the College registrar exactly with no errors. Spell your name exactly the way the College has recorded it. Check ACSIS if you aren’t sure of the spelling. The name must fit in the spaces on the mark-sense form. You have 10 characters for your first name and 13 characters for your last name. Each part of your name must be written in its corresponding field; you cannot steal spaces from your last name field to use for your first name, or vice-versa. For example: If your first name is ROBERT-CARLOS YURI and your last name is TREMBLAY JARIWALA KIYOKAWA you must enter ROBERTCARL as your first name (limit 10 characters) and TREMBLAYJARIW (limit 13 characters) as your last name. Do not use the abbreviation BOB. Do not mix up any parts of the first and last names; keep them separate and truncate them to fit as needed. Remove all spaces and hyphens from each part of your name. The bubble sheet requires your College last name (family name) to be written on the left, followed on the right by your College first name (given name). Use the first and last names with which you are registered at the College, not whatever names you normally use. In addition to filling in the bubbles, also write your names in the spaces provided above the bubbles so that a human (your instructor) can read the names. Off-campus: Algonquin Registered Name Game. On-campus: Algonquin Registered Name Game. You may only select one answer per question. Pick the best one. Erase completely any mistakes you make on the mark-sense form. You are responsible for bringing your own excellent eraser. Everyone gets a different computer-randomized version of the test. Your Question Sheet is different from every other one. Do not omit your last name. For midterm tests, write your three-digit Lab Section Number (not your lecture section number) in the space provided. You will get your midterm test question sheets returned to you, if your instructor can read your name and Lab Section Number on the question sheet. You need your question sheet to do the follow-on assignment after the midterm test. You must get your question sheet back. Enter the Lab Section Number of the lab section you attend, even if it is different from your assigned lab section number. Your instructor will bring your question sheet to the lab section you indicate. If what you write on your question sheet isn’t a valid lab section number, you will have to make an office appointment to get your question sheet back; this will delay your ability to start the follow-on assignment. At the end of the test, you must hand in everything you were given. You must hand in your question sheet, your mark-sense form, and any scrap paper you were given. Hand in everything you were given, including all scrap paper. For midterm tests, you will receive an email with your score and right/wrong answers within a day or two of the test, if you have filled in all the information correctly. Your marks will be delayed (and a penalty assigned) if I have to contact you to correct the information you put on your test. Please add idallen@idallen.ca and alleni@algonquincollege.com to your email white-lists. Check your junk mail in case Algonquin misdirects this email. You will need your own personal question sheet to make sense of the answer email. In your lab period after the test, get your own question sheet from your instructor and compare it with the email you receive. Do not lose your midterm question sheets. Assignments and quizzes may refer to it. Go to your My Grades and find the quiz. Click on the quiz name to open the View Attempts window. Go to your course and open and Begin the quiz again. You will see a Test previously taken screen with a button that says View All Attempts. Click that button.